We are sentimental creatures. And by this I mean to say that we have the capacity to balance our emotions with our mental facility. From Wiktionary, we learn this about the word sentimental and its origins: “A vogue word mid-18c. with wide application, commonly a thought colored by or proceeding from emotion” (1762). The word sentimental suggests a balance: the human balance. At our worst, we are motivated by instant emotion and behave as instinctual lizardbots, reacting to life with mirror jihads and fast food. Or, equally bad, we can be Vulcanesque in avoiding emotion, numbed by too large a dose of cautious logic. At best, we temper our immediate emotions with experience, consideration, comprehension. When emotions rise from and result in intelligent, cognitive reaction we achieve worldview, thoughtful action, true choices. This requires a porous barrier between emotions and thought. Also, this fluidity requires one to stand back, take stock, and act in the world from an emotionally considered space. This is no easy task. It requires practice and exercise. Art — whether theater, object, literature, or interactive media — kindles our humanity. Art is the perfect way to practice operating from emotion and intellect simultaneously. So often, art provokes an immediate emotional response that makes us think. Or it makes us think until we are suddenly laughing with joy. And by art, I am inclined to a broad definition: any artifactual catalyst for sentimental experience. It softens that barrier between emotion and thought, allows us to be truly sentimental. It allows us the proper amount of self-consciousness to be real people. I want to have at least one art experience a day. In Madness, Rack, and Honey, Mary Reuffle tells us, “Theatre requires you draw a circle around the action and observe from outside the circle. In other words, self-consciousness is theatre.” I propose we replace theatre with art: “[art] requires you draw a circle around the action and observe from outside the circle. In other words, self-consciousness is [art].” That done, let’s play with the metaphor: extending the boundary makes art more available; it makes more of our experience part of the production and increases the surface area of art in our lives, thereby increasing the opportunity to encounter an art experience. The UX and paratext of digital experiences (i.e. film, TV, story, gaming) draws that circle. In most instances, the boundary is akin to a hard stop, a period. The action is on the page or screen, on the other side of a physical divide. In punctuation terms, there is a hard stop, a period, between the media (paper, screen, console) and you. I propose we experiment with making this barrier a semicolon instead. Defined as “a mark that connects complete speech acts and ties them together,” the semicolon represents a more fluid experience. The semicolon allows flow without full stops. It shows relation between statements, not division. And this is the promise of digital technology: digitized delivery may soften the boundary between art and our lives. The modern mark and usage of the semicolon was invented by Aldo Manuzio (also known as Aldus Manutius), the 16th-century printer responsible for other such durable innovations as italics, modern comma usage, and inexpensive pocket-size books. In contemporary terms, he was a senior User Experience entrepreneur working to improve the print platform. 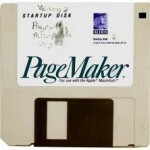 In fact, the first “word processing” program I ever purchased was PageMaker, by a Seattle company named for Aldus. Their logo has his image right there on the floppy disk, drawing a straight line from some dusty Italian atelier to my equally dusty but likely smokier dorm room. Logos can be instructive this way. 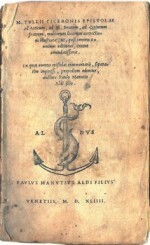 Aldus’ (the man) own logo was also significant. His work was adorned with a dolphin and anchor emblem borrowed from an ancient Roman coin. Here it is, beneath some of his revolutionary italic print. The dolphin and anchor symbol was associated with some folksy ancient Roman wisdom, at once a motto and a koan: “Festina lente” (literally “make haste slowly”). A lovely sentiment, this. It urges a balance of intent and care, emotion and consideration. 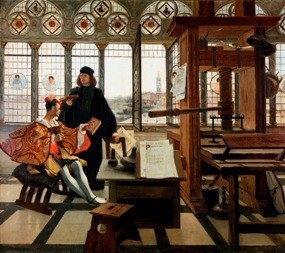 This adage was commonly applied and portrayed in the Renaissance. In addition to the anchor and dolphin, one finds “Festina lente” represented as a crab and butterfly or as a hare within a snail shell. And as the mighty semicolon! It says HARD STOP and MOVE ALONG at once. Festina lente: a true contradiction. Koan as punctuation! As such, it’s a spy amidst the other marks, a non-mark that only speaks to the essence of things. It’s about meaning, not mechanics; it’s a fluid boundary — a low fence at most, a sign at the border at least. Semicolons can make some people uncomfortable, which is a good sign. Kurt Vonnegut warned, “Here is a lesson in creative writing. First rule: Do not use semicolons. They are transvestite hermaphrodites representing absolutely nothing.” Good! Good! That’s the spirit. This hints at the sort of shamanistic madness required to fuel real innovation. Austen, aside from eroticizing the question mark for me forever, summarizes evocatively what is so mysterious about the semicolon. It’s a drunken madman at the gate. A winking stranger that says “come here” and “run away” ;). That’s the sort of border I want to construct between digitally mediated experiences (film, TV, game, story) and physical life experiences. The line around the theatre is porous. The semicolon allows art to leak out of its containment field. Let us all — artists, UX professionals, entrepreneurs — hasten slowly to innovate in this curious, relational, semicolon realm; we can improve our sentimental souls by so doing. I hereby offer semicolon services to all comers — let’s work together to soften the boundary and integrate digital experiences into the wider world.